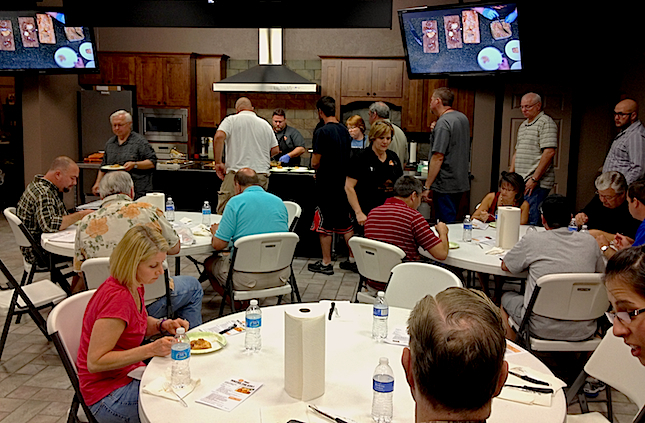 Over the weekend we hosted three of our famous All Things Barbecue cooking classes in our brand new teaching kitchen. Every one of these classes was sold out, which just proves how many people want to learn from pit master Andy Groneman of Smoke on Wheels Competition BBQ! This class setting promotes interaction between the attendees so you meet new outdoor cooking enthusiasts, eat great food prepared by an award winning chef and learn the secrets of preparing all of the dishes that were served. Friday night’s Master the Grill class featured a New England inspired “Blueberry Slump Cake” for the baked element, and you could’ve heard a pin drop when it was served. Along with this wonderful slump cake, over the entire weekend, we featured Andy’s award winning ribs, filet mignon, pork carnitas, grilled sea bass, Andy’s Blue Ribbon Brisket, and much more! This class weekend we welcomed Al Brendel from Riverside, California and Dave Trent from Carrol, Iowa; both do their outdoor cooking on a Yoder YS640 pellet grill. Good times, great fun and outstanding food, that’s what best describes cooking classes at All Things Barbecue. For more information about the classes, click here, and don’t forget to sign up for our mailing list so you can stay in the loop for all upcoming classes at All Things Barbecue.